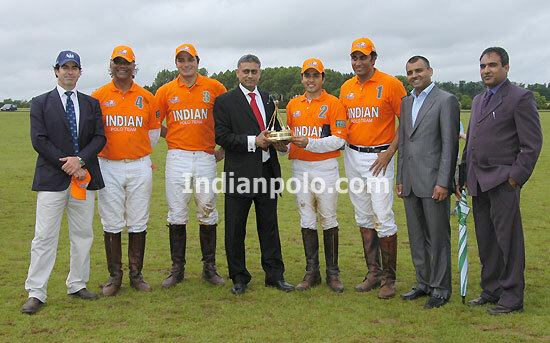 India emerge as winners over England to lift the Asia Cup played at the Kirtlington Park Polo Club, UK. The Asia Cup between England and India was played on Saturday 30th June at the private Kirtlington Park Polo Club, UK. Despite the rain the majority of the VIP guests arrived for the charity VIP lunch in aid of Kids Out which raised much needed funds for the charity which had Ian Salisbury as its ambassador for the day. Ian was joined by fellow Surrey cricketers James Benning, Chris Schofield and Jon Batty. Other celebrities on the day also included Indian legend Kapil Dev, actor Raj Ghatak, Syed Ahmed from the Apprentice and Hot Air and other British Asian stars. Also gracing us with her presence was Princess Shruti Medtia of Karauli in Rajasthan. Her husband Ajit Singh Medtia was captaining the India team and he duly greeted the VIP guests for lunch with an explanation of game of polo for the uninitiated. After a short delay for rain the teams took the field with India storming into a lead through impressive play by Satnam Dhillon. England fought back well in the third and fourth chukkers to bring the score to 5.5 to 5 with India defending stoutly. With a rousing finish India just managed to hang on as the final whistle went just seconds before England scored to leave India as the winners. The final score was India 5 1/2 - 5. Satnam Dhillon was named player of the match with Sunil Chopra presenting the prize. Although the rain returned in the evening it could not dampen the enthusiasm or spirits of those attending the Maharajah Ball in the evening. Ghurkas welcomed the VIP guests, many of whom in costume, through a themed marquee where they enjoyed wonderful Asian cuisine and a show from a Bollywood dance group. After dinner the charity auction raised thousands for the Spinal Injuries charity and then guests danced the night away and played the poker and roulette tables in the Maharajah Club casino.